Made in USA. Makes 2 thin 5" cookies Cast aluminum plates Preset automatic thermostat ranges from 350°F to 400°F 10 year warranty Made in USA This very popular iron is designed to make delicious crispy high ribbed 2 pizelles in half the time required by hand irons. Makes 2 thin 5" cookies, 120v 800w, UL listed, Cast aluminum plates, Chrome and cast aluminum body, 5 year manufacturer's warranty (Palmer stipulates that you contact them directly for warranty repairs.) Stainless-steel lid, cast-aluminum body. Bakelite handles and feet. 10" x 13 1/2" x 3" high. 5 lb. 1250W. This product is intended for use in the United States and Canada and is built to United States electrical standards. Made in USA. Use wood, plastic or heat-resistant nylon tools to avoid scratching the baking surface. Clean baking surface with a soft brush or damp cloth. Wipe exterior with a damp cloth. 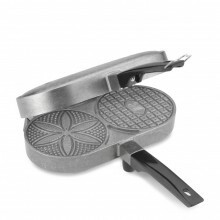 Click the button below to add the Palmer Pizzelle Maker Made in USA to your wish list.